Skin tags on eyelids and around the eyes are easy to identify. Unfortunately, the positioning can sometimes make them difficult to self-treat. Skin tags are more commonly found on dry skin areas such as the neck, armpits, and groin folds, so it can be a little disconcerting when you find them in close proximity to your eyes. 2.2.2 Do Treatments Have Risks or Side Effects? 2.3 Can Skin Tags Under Eyes Be Prevented? When you find skin tags around the eyes, you may become self-conscious because they are so visible. There could be several reasons as to why you have developed them; although there really aren’t any clear-cut medical reasons that have been found by scientists as of yet. The medical experts don’t entirely understand the connection between skin tags and eyes. That said, there are lots of reliable theories that have been put forward by research scientists and experienced doctors. There’s nothing concrete, though. Genetics, weight, health, and your lifestyle, hormones, and age can have a significant impact on your skin and may be one of several causes related to skin tags forming around the eyes. One of the biggest causes of skin tags, especially in other areas of the skin, is friction and skin rubbing. The skin may rub against the skin, or the skin may rub against jewelry or clothing. The same skin rubbing movement applies to the skin surrounding our eyes. Think about all the times we blink and move around and even smile throughout the day. The latest research suggests that people blink as many as 1200 times per day (or 15 to 20 times per minute)! Each one of these small movements causes the skin around the eyes to tighten, furl, and stretch. Therefore, we can consider that this friction is causing small skin tags around the eyes as it would on other areas of the body. The problem only gets worse as we age because the skin starts to lose its elasticity. The problem is further exacerbated by weight gain because it leads to additional folds of skin and friction. Hormonal fluctuations are also a likely cause for skin tags, and this is especially true of obesity, pregnancy, and age. An obese individual may have problems with Leptin, a hormone that helps us feel full. It is a hormone that is harder to regulate when an individual is pregnant or overweight. When more of this hormone is produced, it can essentially promote benign skin growths. Estrogen, another hormone, may be a culprit as well. As we age, our bodies begin to produce less estrogen which can have damaging effects on our skin. While there is no clear evidence that there is a link between lower estrogen levels and skin tags, one might assume that it is one more skin problem among many plaguing those with lower estrogen levels. If you’re interested in finding out more, you can get further information on the causes of eyelid skin tags in this post. You have noticed small bumps around the eyes but are unsure if they are skin tags. Well, it can sometimes be difficult to discern between warts and skin tags- especially if you have never seen them before. Are you looking for a safe way to remove skin tags from under and over the eyes at home? Well, there is some good news. 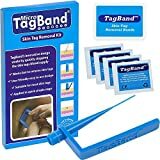 They’re simple to remove with a good over-the-counter skin tag removal product. According to the Mayo Clinic, skin tags are benign and flesh-colored bits of skin attached by a thin stalk. Some people mistake skin tags for other conditions and others worry that they’re a sign of a severe medical problem, but you needn’t worry. Skin tags are completely harmless and are considered benign growths. The problem with skin tags is that they are not aesthetically pleasing, they can grow larger, or form in a small cluster, and can cause a drop in a person’s self-confidence. And, if you irritate a skin tag, it can also become infected. That’s why people look for safe removal methods (that work). We’ll explore proven ways on how to get rid of skin tags on eyelids or that are close to the eyes. We’ll be looking at over-the-counter (OTC) and all-natural methods. That way, you can find the right approach for your needs. We’ll then explain what you can do to get faster results from your own home. How you go about removing skin tags will depend on their size and, of course, the proximity of the skin tag to the eye. If they’re too close to the eye, millimeters away, don’t take any chances with your health. It’s time to get a consultation with a dermatologist. Let’s look at the top-rated eye skin tag removers. Here is a quick summary of the features of the products in the table (below). Clicking on the ‘check price’ link will reveal customer reviews, product information, questions and answers, and the latest pricing. You want an eyelid skin tag removal treatment that works quickly and safely. Being able to remove a skin tag will save you time and money. Unless it is right next to the eye or the skin tag has become infected in some way, you probably won’t need to see a doctor or dermatologist. The tying off method is an excellent choice for the removal of medium-sized skin tags around the eye and on the eyelid. It is an inexpensive over-the-counter (OTC) product that gets the job done. It will make the removal process easier and more effective. Pro Tip: Many people have enjoyed success with the TagBand skin tag removal device. Insert the small band (provided) onto the cone and release it over the skin tag. This band will prevent blood from reaching the skin tag. You’ll notice that your small growths will start to change color (turning a purple or black) and will fall off in around 7 to 10 days’ time. The surrounding skin will gradually return to its natural tone over the next few weeks. We’ve also put together an in-depth TagBand Review to help you. Read this guide if you’d like to find out more about how and why it works. If a skin tag is too small, you probably won’t be able to apply floss, a band, or string around the stalk of the skin tag. That’s why it’s so important to choose the right treatment or technique. A safe, natural, and effective way to get rid of skin tags around the eyes at home is by using essential oils. 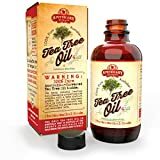 Tea tree oil, as we go into more depth about below, is one of the more popular methods. However, lavender essential oil, lemon, oregano, and frankincense oil are also commonly used to remove skin tags as well. When using essential oils, you will want to make sure that the oil is 100% pure and is of a high-quality. It is also recommended that you speak with your doctor prior to starting any essential oil treatment to ensure that it is a safe method for you to use. Additionally, you will want to make sure to dilute any essential oil you use with an equally high-quality carrier oil such as coconut oil or olive oil. If you do have small skin tags (or a cluster), tea tree oil can make treatment a lot easier. Put Apothecary tea tree oil onto a cotton swab. Apply it to the skin tag(s) three times a day (morning, after work, and before you go to bed). Pro Tip: Take your time and apply the tea tree oil with care. Although it’s a natural solution that you can wash away, it has the potential to cause irritation if you get any onto the eye. Never apply it when you’re in a rush as it increases the likelihood of a mistake. Tea tree oil is an all-natural solution, so there’s no risk of scarring. The downside is that it takes longer to work, and it doesn’t work for everyone. Most people will find that they can get rid of a skin tag near the eye with tea tree oil in around 4 to 8 weeks. Of course, it doesn’t remove skin tags for everyone, but it’s one of the few natural methods that may work. Additionally, if you miss out on sessions, the treatment is not going to be as effective. It takes diligence and patience for it to work. In fact, it’s one of only a few natural remedies that we recommend. However, you must follow the directions and apply it as directed. Important: We often get asked if apple cider vinegar works or if it’s a myth. Well, we don’t recommend putting apple cider vinegar on a skin tag. While it helps with certain health/skin conditions, there are no medical studies that back up that it works. 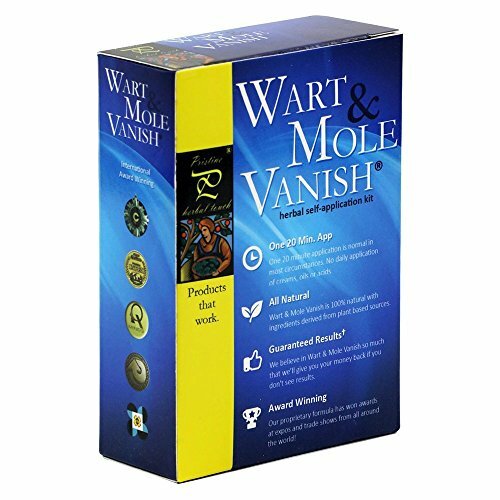 Another product that works, even on sensitive parts of the body like the eyelash line, is Pristine Wart Mole Vanish. It’s the fastest way to get rid of skin tags near the eyes. Apply the cream, and your skin tags will go away after approximately twenty minutes. It stings, as you’d expect with a chemical cauterization cream, but the results have been excellent. We recommend that you read our review on how to remove skin tags near eyes with this product as we cover everything in much greater depth. We like the fact that you can control how much of the cream that you apply (and where you use it). The substance is quite thick (not overly), which helps a lot given the proximity of the skin tag to the eye. The application process needs to be precise. You don’t want a really runny or excessively thick cream. A runny cream could damage the eye, and thick cream isn’t going to work. If you accidentally get any of the treatment in your eye, you should bathe the area thoroughly and pat dry with a clean towel. You’ll receive a small pot of the cream with a precision applicator. The treatment will cause a stinging sensation that lasts for about a minute, and your eyes will likely water. You’ll notice some redness when you’re done, but it’s a single-application treatment. The symptoms will gradually fade away. After just one application, a tiny black scab will form, and the skin tags will be gone. Don’t disturb the scab as it will cause damage to the skin. Think about the time when you rubbed the skin off your knee as a child. Allow the scab to heal on its own, applying some Aloe Vera each day until it heals. 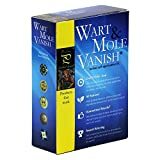 Read the Latest Wart Mole Vanish customer reviews and check pricing. Over-the-counter skin tag removers typically cost between $20 and $100. While price isn’t always indicative of quality, it’s true that not all products are created equal. That’s why it’s important to check the feedback that’s been provided by previous customers. The decision to consult a doctor is expensive because you’re paying for years of education and professional experience. They offer medical certainty and peace of mind for the patient. The prices charged vary significantly based on the location and profit margins of the medical practice. You will (most likely) have to pay for an initial consultation session and each skin tag removed. We advise you to check the prices of different medical practices. You should also look at the prices of the various procedures. Cutting off a skin tag with a scalpel is cheaper than laser surgery, for example. Your insurance company is unlikely to cover the cost of the medical procedure unless there is a genuine medical concern. For example, a biopsy is required, or a skin tag has developed an infection. Regardless of the treatment, be careful when applying any treatment close to the eyes. If you feel anxious, or have unsteady nerves, at-home procedures should be avoided. A skin tag is just a cosmetic problem, so don’t do anything that will turn it into an ongoing skin condition. A doctor will discuss treatments and provide an enhanced level of medical expertise. Your doctor will also be able to diagnose the condition with a high degree of accuracy. There are many reasons for small bumps near the eyes, such as a clogged tear duct, so you need a precise diagnosis (if you’re unable to accurately self-diagnose the condition). Pro Tip: It’s usually easy to tell if you have a skin tag. They are fleshy (soft) growths that appear on the end of a short stalk. Most people find that they’re the same color as the rest of the skin, but the color is often white when they’re around the eyes or on the eyelids. Here is some information on other types of benign skin growths. Do Treatments Have Risks or Side Effects? Natural is safer, but it doesn’t mean that it’s guaranteed to be safe. For example, you may find that you develop an allergic reaction to an ingredient that doesn’t affect others. We all respond differently. While we understand that you’re keen to get rid of skin tags near the eyes fast, you should always test your essential oil on a less visible, yet sensitive, area of the body first. Be careful not to get any runny solution in your eye. Use a cotton ball or cotton swab to control the amount and placement of the fluid. Wash the area immediately if you get any in your eye. If the irritation doesn’t go away, seek immediate advice from a doctor. If you’re planning to cauterize skin tags by the eyes with skin tag removal cream, you’ll need to allow sufficient time for recovery. While your skin tags will be gone in less than twenty minutes, it’ll inevitably take more time for the redness to subside and the skin tags to fall off. Give your facial area and hands a thorough cleaning before you commence. This will remove any germs, bacteria, and dead skin, and will help minimize the possibility of getting a painful and unsightly skin infection. Always read any product instructions that are provided by the manufacturer. People are so keen to get results that this critical stage is often skipped. Missing a step could have negative implications for the removal process and its effectiveness. Removing skin tags during pregnancy isn’t recommended. They’re caused by elevated hormonal levels. Once the hormones settle down, it’s likely that they’ll go away on their own. See if this happens on its own after you’ve given birth. Can Skin Tags Under Eyes Be Prevented? Losing weight may help because your skin won’t rub against itself as often. Get any medical issues treated. Some research suggests that skin tags can be a pre-diabetes symptom. Consider wearing looser/lighter clothing so that you don’t sweat as much. If you decide to remove skin tags from the eyelids, you should proceed with caution. Natural methods, such as Australian tea tree oil, is the safest (when applied with care). Before you apply it, you should check how your skin responds. If a skin tag is close to the eye, you need to be careful. For any other questions or concerns you may have about the skin tags on your eyelids, around the eyes, and under the eyes, and any of the remedies we have provided, you should seek the counsel of your doctor or Dermatologist. While it may be tempting to self-diagnose and self-treat the skin tags yourself, you still want to make sure they are in fact skin tags and not something that can cause more serious complications down the road. Bottom line? If you are not sure what you have, discuss it with your doctor before proceeding with any of the treatment methods mentioned above.